Floyd Mayweather gestures during the final news conference for his bout against Shane Mosley at the MGM Grand. 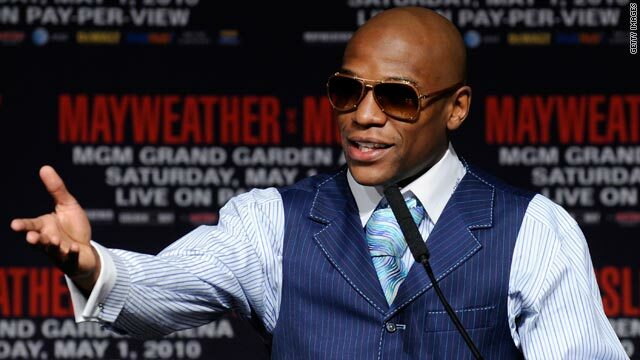 (CNN) -- Floyd Mayweather will cement his position as the most bankable boxer in the world in Saturday night's non-title welterweight fight against fellow American Shane Mosley in Las Vegas. The 33-year-old, whose nicknames include "Money," has already generated $292 million in revenue in six pay-per-view fights for broadcaster HBO, from 5.5 million buys. He is expected to take home $58.5 million for himself if the battle with veteran Mosley achieves two million subscribers. Mayweather is already fourth on the broadcaster's all-time list behind Oscar De La Hoya ($610.6 million on 12.6 million buys from 18 events), Mike Tyson ($545 million on 12.4 million buys, 12 bouts) and Evander Holyfield ($543 million on 12.6 million buys, 14 fights). De La Hoya and Tyson have both retired, while the 47-year-old Holyfield last month kept alive his unlikely dream of winning the world heavyweight title for a record fifth time by claiming the little-regarded WBF crown in front of just 3,000 people in Vegas. Mayweather's 2007 victory over De La Hoya earned a record $120 million for a single pay-per-view event from 2.15 million buys, and HBO told CNN that his fight with the 38-year-old Mosley is set to qualify as a true "megafight." "In boxing, megafights are those that reach one million buys," HBO Pay-Per-View senior vice-president Mark Taffet said. "By every indicator -- ticket sales, closed circuit television sales, views of video on the Internet, and the number of viewers of HBO's 24/7 series -- Mayweather-Mosley is on track to becoming a true PPV megafight. "Whether on television, radio, newspapers, magazines, Internet, Facebook, MySpace, iTunes, Youtube, HBO, or at retail stores across the country, fans everywhere are surrounded by this great event. The Mayweather-Mosley buzz is everywhere." Mayweather is undefeated in 40 fights, and has won six world titles at five different weights. However, he has lost his No. 1 ranking as the highly-regarded Ring Magazine's world's top pound-for-pound boxer to rival Manny Pacquiao. The two were due to clash earlier this year but the Filipino pulled out due to Mayweather's demands for Olympic-style blood-testing. "Floyd Mayweather is a bonafide PPV superstar," Taffet said. "He is one of most prolific performers in PPV history. "But it takes two to make a true megafight and, like Floyd Mayweather, Shane Mosley is a future Hall-of-Famer and one of the most recognizable boxing stars of this era. Shane is a critical ingredient in the megafight status of Mayweather-Mosley. "While Shane and Floyd definitely have very passionate fan bases in their hometowns [Lynwood, California and Grand Rapids, Michigan respectively], both Mayweather and Mosley are national figures with broad and diverse fan bases throughout the entire U.S.
"As the 'Who R U Picking?' polls indicate, fans everywhere are talking about this matchup and it is virtually a 50-50 split as to who the fans think will win." While many pundits expect Mayweather and Pacquiao to agree to fight by the end of this year, the American has taunted the Filipino by saying he is not enough of a box office draw. Pacquiao's fights with De La Hoya and Juan Marquez brought in significantly fewer buys than Mayweather's clashes with the duo. "He needs to learn how to do numbers like I'm doing," Mayweather, who shunned the chance of winning the WBA belt against Mosley as he did not want to pay the sanctioning fees, told Boxingscene.com. "He needs to step his game up. I'm not worried about this [Mosley fight]. I know I'm going to do crazy numbers. I should walk away with about $40 million. With or without Pacquiao I'm going to be able to go out and make $20 million or $30 million a night."